Liberty Mo wrote: Just curious as to what other tubas Wessex will have at TMEA? ok, I'll bite. what's the significance of the name? A tribute to Wessex genius tuba designer, Chuck Nickles! Wyvern wrote: The Wessex Kaiser will be supplied with the type of funnel mouthpiece that is popular with German players to use with large Kaiser tubas. ^ This just illustrates that everyone has different preferences, and mpc choice is very personal/individual. I personally prefer medium or medium-shallow bowl mpcs on my Kaiser BBb for now as least. Wyvern wrote: A tribute to Wessex genius tuba designer, Chuck Nickles! I sort of doubt that I would use a deep anything – neither cup nor bowl - when playing one of those instruments, but who cares what I would play? The main point of the original post was to draw attention to the fact that this is a very different instrument now available for Western Hemisphere people to review…a different experience. Depending on the quickness of adaptability of the player, it might take two to twenty (more?) minutes for an individual player to figure out what’s going on with one of these, and to determine what they need to do in order to play it. Again, it’s quite different. I would say a big thing with this tuba is not to overblow. The bell is so high above the players head that it is louder than they may perceive behind the mouthpiece. Play what feels to you as mf when the music is marked f, etc. Let the tuba work to produce big tone. If overblown the Kaiser could obliterate an orchestra, so hold back and only give more if the conductor asks. Have owned an Alex 164 and also 163 for years. Took me some work and a while to „control“ the instruments - vs a pick and play other brands. Have used a borrowed Rudy 5/4 pre Bayreuth in several concerts but went for the Alex 164 due to costs and air management. Play tested the 197/2 of a friend and found that the instrument has a little more projection and „bite“ than the Alex 164 but was told that the 197, as the Alex 164 needs constant training (both are these kind of instruments were you even after a few days of not playing them, even having played other tubas, feel the difference, but if you did, what a sound...). Have also play tested 2 Fafner 195/2 vs my Alexander 163 and witnessed Bob Tucci playing them (one his own 195/2, was also allowed to play text his Rudy BB 5/4 and his Hirsbrunner once, and know also a Yorkbrunner, at least for 45 mins, who belonged to Mr. Monch, Basel, thanks Tim, which I also liked a lot ). Despite of stating the obvious that they are all being a little bit different, the special quality of all these instruments (sound, resonance, speak) boils down to the fact, that they are handmade, which in essence is the use of thin / thinner brass sheets vs the industrial/hydraulic versions in all parts, cutting from sheets for constant and thin wall sections, constant annealing and work hardening the metall by the traditional forming and bending processes (lead, pitch, zerobend....).... If you compare eg a 195 vs a handmade 195/2 the difference becomes obvious. An Alexander weights just about 9 kg and once you touch it first it feels suprisingly light and not as heavy as the size would imply. Final key to a high quality instrument is the mechanics which has partially improved a lot especially on rotories. I wish Jonathan and his team (hi chuck) all the best for the Kaiser and in preserving the heritage and legacy of such great instruments (form, warp bore and taper) but obviously also with the right production technics (substance and resonator). Chris Mayer wrote: How does the Wessex compare to the Melton 197 or the original B&F ? Or in a bit more wider comparison with the likes of Alexander 164, Rudolf Meinl 5/4, Miraphone Hagen etc. ? 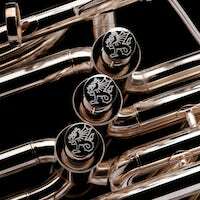 Would these other tubas even have a chance, as the Wessex, besides commercial advantages, is not only „based“ on legacy models but also an improved version and produced within an ever improving design, production and quality factory environment ? Why play the other oldfashioned and expensive stuff ? As finally commercially and technically superior, remaining key challenge would only be to convince German tuba players to play chinese in their humba, symphonic or ensemble groups. (can be done, „made in germany“ has also finally worked out, maybe not as the British had initially intended...). The Wessex Kaiser is a big 6/4 true kaiser, unlike the 5/4 Fafner and the not-quite-a-6/4-kaiser Alex 164. The Wessex is a kaiser the most traditional sense. I spent a lot of time with it Friday, and it is a fantastic kaiser BBb. Easy response, easy intonation (unlike the 197), and played flawlessly. Kaiser tubas are different beasts than York style tubas and even other large BBb tubas. Comparing it to a Fafner or 164 is not an even comparison. The kaiser makes a Fafner look like a pup. The sound is really something to behold if you don’t try to hoss it. I’d play one any day. Last edited by Doc on Mon Feb 18, 2019 10:24 am, edited 1 time in total. How are the valves/linkages? Chinese or German? MikeMason wrote: How are the valves/linkages? Chinese or German? The rotors/linkage on the instrument that I played - where/when I played it - were quiet and smooth. I have no idea where they were made, but I would assume the entire instrument was built by Jinbao. The last time I offered a direct answer to one of your direct questions, someone went ballistic and sent the monitors a diatribe (if nothing else, offering me a valuable insight)...so let's see what happens this time. I seem to recall a German valve option for an up charge. Just curious. MikeMason wrote: I seem to recall a German valve option for an up charge. Just curious. ...I would be satisfied with the valves on the instrument I played. At Midwest I was able to play the Prototype (finished prototype?) Of this tuba and it is awesome. Ease of playing, depth of sound (the "blow and it plays loud"), and response of the valves are great. I'm used to playing on an HB6 so maybe it's just the difference intonation, but the intonation on this Kaiser is pretty dang good. I liked the feel of the valves, and I thought it was probably the most in tune horn wessex sells. I'm a fan. I'm tempted to post a pic I took of a Student of mine playing it. (16 year old girl playing this MAMMOTH tuba) it's pretty funny, but out of privacy concerns, I won't do it. really leapfrogging tuba advertisement ! Is this tuba a threat to the National Security of the United States ? Doc wrote: Easy response, easy intonation (unlike the 197), and played flawlessly. Kaiser tubas are different beasts than York style tubas and even other large BBb tubas. Comparing it to a Fafner or 164 is not an even comparison. The kaiser makes a Fafner look like a pup. The sound is really something to behold if you don’t try to hoss it. I’d play one any day. How does the size of this compare to the Melton 200 Kaiser?